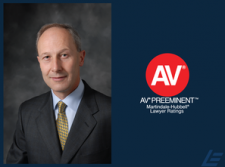 We are proud to celebrate James Eccleston’s 2018 Martindale-Hubbell AV Preeminent Rating. James received the highest possible rating in both Legal Ability and Ethical Standards, which is the highest possible qualification that Martindale-Hubbell can bestow upon an attorney. Martindale-Hubbell was founded in 1868 as a print information services company to the legal profession, which is also now available on the internet and contains the profiles of over one million lawyers and law firms nationwide. The service provides peer reviews and background information on United States lawyers and law firms. With 16 years of the highest possible peer rating in Legal Ability & Ethical Standards, you can trust with peace of mind that you are in the very best hands with James Eccleston at Eccleston Law, LLC.